I'm not actually sharing fruit salad today! Kassi issued the Creative Inspirations Paint Team the following theme: Fruit Salad...let fruit inspire your project. I found the perfect papers from Cosmo Cricket and paired them up with the wonderful Multi Step Berries set from Kitchen Sink Stamps. I used MTSC81 for my sketch inspiration. Looking for more inspiration using Creative Inspirations Paint, click here to see what the other designers created this week. While your there, be sure to check out the wonderful tutorials posted using the wonderful paints. If you have paints on hand be sure to upload your artwork on the blog using the InLinkz Feature, we'd love to see what you've been creating with the paints. We have been having lots of fruit salad this week and this is a fantastic reminder of them. The berries look delicious and the design is lovely. Great card, I love the green, nice n' fresh! Berry refreshing! Luv the card and layout. Scrumptious strawberries! The designer paper is made for that yummy stamp! Wonderful card! I wonder if you did a light spray with a matt sealer/varnish if that would work for painting on the stamped image? The berries look perfect to me without any touchup! beautiful card! 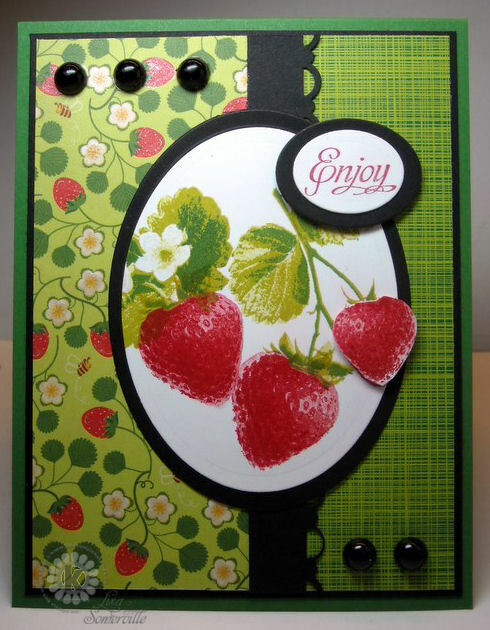 I love how realistic those stawberry stamps are! random thought... what if you painted the paper before you stamp? the shimmer should still show through... just thinkin' here. Would this card fall under the title of "edible arrangements"? Those berries look so fresh, I love the designer paper, awesome job! Lisa, this card is beautiful (good enough to eat) I don't know how I did it, but I missed Fairy Dust. Can't wait until my new paints come. Oh yummy!! This is one delicious card! Love the card! The stamp is so realistic! Great job!! Love the image and I certainly love the way you've combined the strawberry dp to go with it. How yummy! I love this!